Pre-assembled modular offices are extremely popular in many of today’s working environments. These pre-assembled buildings are used as management offices, accounts offices, project management offices and many other type of offices in medium to large scale employment complexes. A pre-assembled in-plant office can also be used as pre-assembled guard houses and pre-assembled guard shacks. 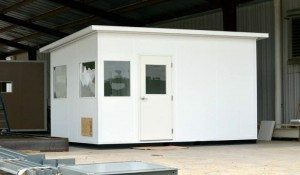 These pre-assembled buildings are ideal to be used as temporary guard offices as security offices need to be moved to different locations within the premises according to the security requirements of the business entity. This article will highlight the major benefits of a pre-assembled modular office. The efficiency of this office system will eventually transfer into cost saving for your company in the long run. Full height moveable wall materials are pre-fabricated in a controlled environment as an alternative to the rigidity of drywall and steel studded office constructions. The installation procedure is more efficient and quicker than the conventional construction. 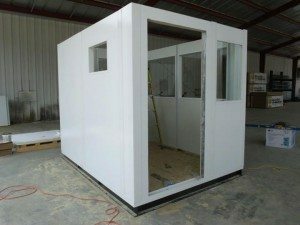 This type of pre-assembled buildings or guard booths can be built in a day or two compared to weeks of time spent on building conventional office rooms. The labor requirement is much lesser than the requirement of labor to build conventional rooms with walls. The ability to relocate, re-purpose and adapt the system according to the requirements of the business can save a large amount of money in the long run. Pre-assembled offices introduce less initial materials into the built environment, in the first place. This helps to reduce waste from the start itself. Most of these materials are reusable and recyclable. No dust involved in the construction and renovation processes, helping to improve the quality of air in the environment. The material is durable and could be used for a long period of time. This eliminates unneeded waste at each phase of installation and reconfiguration. The speed of installation reduces the time taken to construct the new office, eliminating any disruption in office work for longer time periods. This will not affect the productivity and bottom line of the office in a negative way. The modular elements can be quickly reconfigured in order to accommodate your evolving needs. Even older buildings can be renovated without having to change the infrastructure of the main office. The module offices are pre-finished, pre-wired and pre-glazed, hence they can be installed while the other work is going on. This would help to reduce the construction schedule and save money for the office. These pre-assembled buildings can easily be modified or improved upon without much of a hassle. They can be reconfigured to fit any improvements to the office. This flexibility will help to save costs for the office. Pre-assembled walls have inner cavities for plug-and-play power or data improvements. These cavities could be used to upgrade the technology aspects of the office without disrupting the rest of the office structure. The flexibility of the modular offices would help the business to improve its productivity immensely. It help offices to meet the changing dynamics of the work environment. Improved productivity again would translate to a bigger bottom line for the business. The customer service of the company is of top notch. You can call the company and a customer service representative will answer all your questions about their products. Custom made modular offices can be ordered as per the requirement of the client, too. For more information click here.